Is Oklahoma Major Example Of Global Warming? I’ve find it somewhat appropriate that the effects of global warming are becoming obvious in Oklahoma, a state that has repeatedly elected a U.S. Senator who claims climate-change science is a vast, conspiratorial hoax. 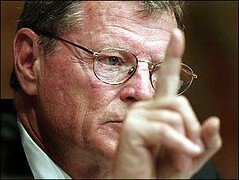 The temperatures keep going up here, the state is even in the national spotlight about it and U.S. Sen. Jim Inhofe’s fight against science and rationality seems punier than ever. Recently, the National Climatic Data Center (NCDC), determined through a recalculation that Oklahoma, not Texas, actually had the hottest summer ever recorded last year with an average temperature of 86.9 degrees. The month of July, 2011 was the hottest month ever recorded at 89.3 degrees. Previously, the hottest summer on record was in 1934 in Oklahoma as well. An excellent Huffington Post article on the new data pointed out the longstanding rivalry between Texas and Oklahoma doesn’t extend to scorching temperatures and drought. The May temperatures, as most Oklahomans know, followed a mild, warm winter, the 11th warmest in history here, according to Mesonet. Neither Oklahoma Mesonet nor the NDCD made global warming claims in the release of their data, but it does appear we’re warming up here in Oklahoma and it’s not unreasonable to consider climate change as a factor. It’s also not unreasonable to conclude that man-made carbon emissions created by the use of fossil fuels are contributing to overall, warmer temperatures. The basic science continues to show this is the case despite Inhofe’s attacks. It’s also just common sense. Poisonous gases released into the atmosphere in large quantities surely have an environmental impact. Oklahoma’s warming weather could be seen as a major smackdown of Inhofe’s crusade, but it’s highly unlikely the senator will stop with the conspiracy theories anytime soon. Inhofe has even claimed “victory” in his fight, though it’s unclear just what that victory means against the prevailing scientific data. Obviously, one hot summer or one warm winter in Oklahoma doesn’t mean we’re approaching a doomsday soon, but when the local data is combined with planetary trends and scientific evidence it begins to add up. Inhofe’s home state is getting national attention when it comes to global warming, but even that probably won’t deter him. Meanwhile, the amount of campaign contributions from the oil and gas industry that Inhofe receives–$491,000 since 2007–make his claims automatically suspect.